then please come on down and get involved. If anyone would like to do the coaches course, then we could do with some help in this area too. Wow, how fast has this season gone??? Another batch of new Bronzes through, a few more awards achieved; some ARTC, a couple of Silver Medallion Beach Management's, making two more patrols self sufficient...lets hope we can continue to grow over the coming season. Our first Tri-club carnival for a few years, was a success..although the conditions I believe, left something to be desired...it didn't phase our kids in the slightest, each of them giving all they had for a fun filled, action packed, nippers session. Well done kids, and many thanks to those who were able to give up another Sunday morning! Also, a big thanks to Coledale SLSC for hosting, Cheers from all of us! Next item on the agenda, is our Final nippers session of the season, and of course the annual presentation. Last year's was a little damp, so hopefully we'll have some fab sunshine, and enough kids can enjoy the jumping castle. Don't forget to turn up on the last day either, it's usually the best! 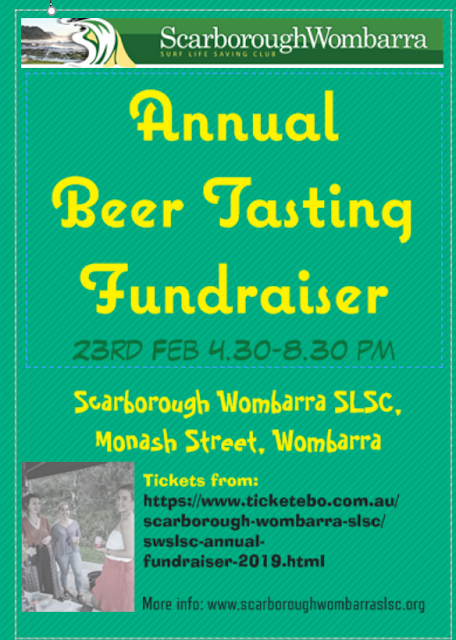 Following this weekend, we have our annual beer tasting event, thanks so much to Five Barrels Brewery for stepping in at the seventh hour and saving the event. Unfortunately we chose a weekend that coincides with the Annual Craft Beer Exhibition in Canberra...doh!..which ruled out most of our usual sponsors. Flick over to the events page for all the details on ticket purchases, and times..etc.. The end of April brings a close to our ever eventful season, with not very many patrols left for us all to do. We are definitely having a decent shindig for our senior presentation this year, stay tuned! 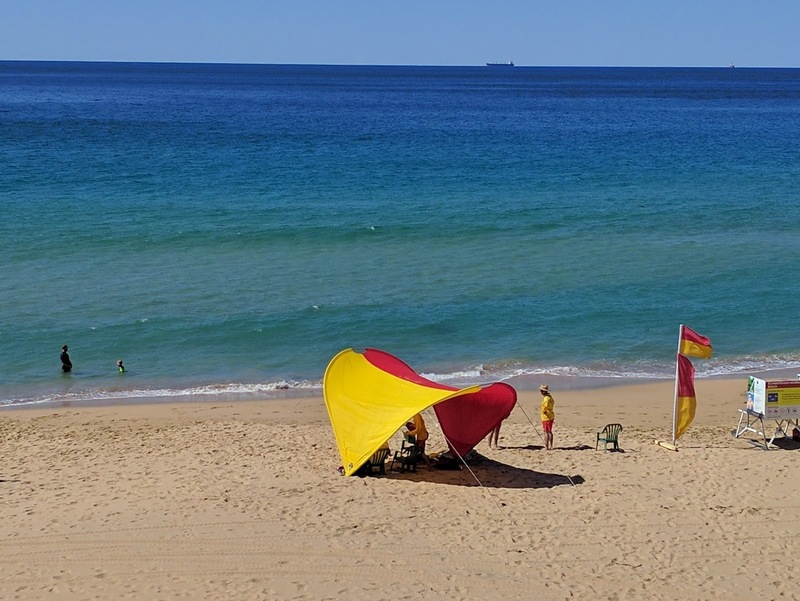 Please take care in the water, always swim in the marked area, between the red & yellow flags. We study the beach for quite a while before we put the flags up, so they are placed in the safest place to swim. Follow the directions of the lifesavers on patrol, as they are experienced with conditions at our beach, and want the best experience for you on the day. If you do get caught in a rip, try not to panic, raise your hand to signal you need assistance, if you are a confident swimmer, swim across the rip until you hit waves which can carry you back to shore. If you are not very confident, still raise your hand to ask for assistance, and roll onto your back and float with the rip. Someone will come out and help you back to shore. Please don't swim against the rip, this will only tire you out quickly. Be sun safe! We have had some extremely hot weather recently, and this can cause not only unwanted and painful damage to your skin, but can dehydrate you rapidly. Put your sunscreen on before you leave home, or before you go out into the sun. Make sure you have plenty of water to drink, and food to eat, seek shade when possible and cover up during the hours of 10.00 am and 4.00 pm and if you happen to get burnt, treat your skin as you would for any other type of burn! Share your good qualities on the beach, we are a multicultural community, and we welcome the differences between cultures. Respect is the key word. Alcohol is prohibited on the beach, as are any glass containers. please respect that this is a family beach, and also a dog beach before and after hours. Take photos & Leave Footprints....in other words, please take your rubbish home with you. The club only has two small bins, which will not be emptied until next week. If they are full, please don't leave your rubbish beside the bin for animals to spread around. 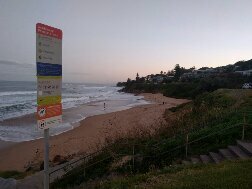 If the toilets at the surf cub are closed, then please walk down to the Wombarra Pool and use the toilets there (before 8.00 am or after 6.00 pm). The back of our club is often a play area for kids!!! Please celebrate Australia Day, safely and peacefully, and enjoy one of the best environments the Illawarra provides. What a start to the 2017/18 Season! Great start to the season with most of the patrol captains able to make the first patrol of the season. After a fab sign up session at the Bowlo, which netted us a small number of newbies and returnees, we started the roster with seven patrols. This was awesome, as we had lost a few key players over the last couple of seasons, and were worried about having to go back to 6, luckily some last minute rego's, helped us get over that hump. The challenges of the season are to have as many patrollers attain the required awards, whilst maintaining life balance, and maximum enjoyment out of their rewarding Sunday shifts. With the beach being quiet and tucked away, we cater mainly to the locals, and we do that well, with the occasional passer by chancing upon our secret location! Dave Denton managed to put a number of BM's through on the Club Open Day and has been back and forth between patrols ensuring that we have as many as possible proficient by Christmas. Club open day went off without a hitch too, with many family members returning for the new season of nippers, and some putting their names down for patrols too, or for BBQ duties, or for Age Managers, all of whom help to make the club the wonderful place it is. This made the first nippers a memorable day too, with many youngsters heading down to the Wombarra pool for their pool proficiencies. We have a few registered for carnivals, with Ant being the driving force behind getting these kids prepared for competition. Please head over to the members page for the roster for this year. There is still some work to be done on the teams, as we have a rather large imbalance in some instances. Added to this we have a few people out with injuries (not back in the water this season I've been warned), and a few that are still working towards their awards. This being the case, patrol 6 & 7 are struggling until one or two more become proficient. We'll work on that, and hope that everyone will be helpful when re-rostering comes about. Keep an eye out for the President's Report, which will be available after the AGM, being held on the Sunday the 26th November. Have a Brilliant season all, and stay safe.